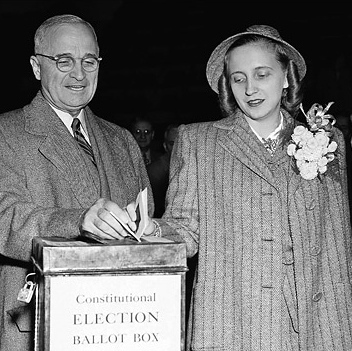 Poor Margaret Truman. Poor Paul Hume. Her concert career was pretty much finished off by her father’s intemperate letter to a frank critic, and Paul Hume’s many years of distinction at The Washington Post are often most-remembered for President Truman’s letter. Some day I hope to meet you. When that happens you’ll need to a new nose, a lot of beefsteak for black eyes, and perhaps a supporter below! …as long as Miss Truman sings as she has for three years, and does today, we seem to have no recourse unless it is to omit comment on her programs altogether. For the sociology of music, though, this event marked important principles. While it is clearly indecorous for the President to promise assault upon a citizen, it it refreshing to realize that he meant to do so as a private citizen without any of the abuse of office that can sometimes occur. However much it may have embarrassed the gentlemanly Paul Hume to be associated with such a squalid situation, he can’t really have expected violence against his person. And Harry Truman’s knowledge of the public was shrewd. He predicted that mail would be eighty percent on his side in the matter. It in fact exceeded that. The spectacle of a powerful man descending from his height in defense of a loved child edified parents everywhere, as he knew it would. This should be remembered in any attempt to pretend that reviews of performances (or our reactions to them) are, or can be, completely objective. Every time I see Margaret Truman’s quite lovely portrait on the wall of one of those upper corridors at Carnegie Hall, I think of the fact that she was the great loser in the famous exchange. In the obituaries for the accomplished author and broadcaster Margaret Truman Daniel last week, every one of them put great emphasis on Hume’s documentation of her sorry singing. She had her father to thank for that, but then she never gave any sign that she regretted his excess of protective love. The fact that a critic could write so honestly, the President-father could react so excessively, and nothing was injured but an already ill-starred career is a great tribute to free societies.